Join me and Angela Kokott, host of Calgary Today QR77 Radio, with our monthly segment, “You are what you eat” to get the goods on healthy eating. As more and more apps are developed in the health and wellness field it can become difficult to know which are reliable and which are not. The Academy of Nutrition and Dietetics in the USA has compiled a list of the most accurate apps based on scientific research. A variety of apps are given a ranking between 1 to 5 with a description of pros and cons by Registered Dietitians. 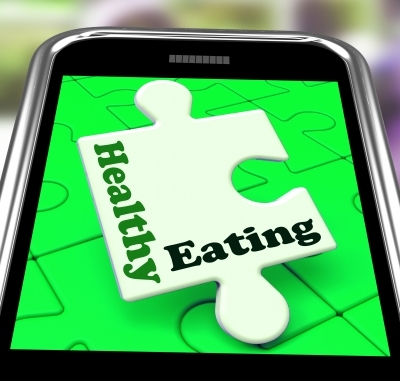 This is a great place to investigate if you are considering a nutrition app. Since many apps are not specific to Canada another good place to look is what leading health organizations such as Dietitians of Canada suggest. Here are a few I like that you may be interested to learn about. Note that I have not selected apps that track calories since I find while these can have a place for some people these can also become very obsessive and take away from developing a healthy relationship with food. FREE app created by Dietitians of Canada for credible nutrition tips on a variety of common questions and topics about nutrition and healthy eating. FREE app created by Dietitians of Canada for a quick search of the nutritional information of foods in the Canadian Nutrient File. Information is displayed in a nutrition facts table and also allows you to compare two products together. FREE app for storing all your recipes, menus, planning, timers and shopping lists in one place. You can access these on any mobile device or share these by email, twitter or facebook. Free app allows you a glimpse but full app is $4.99. This is an app based on the top selling cookbook by Mark Bittman that offers easy recipes and kitchen basics (ingredients, equipment and cooking techniques). You can search recipes under key ingredients, cooking technique, style or recipe type (fast, make ahead, vegetarian and essential). FREE app for anyone that enjoys seafood and wants to consider the environmental ocean-friendly aspect of his or her food choices. FREE app from the Environmental Working Group that provides a yearly list of the “dirty dozen” and “clean fifteen”(list of fruits and vegetables with the potential for highest and lowest pesticides). If you are considering purchasing some of your produce organically this is one list that may help your shopping. FREE app to help you add up which foods are providing sodium in your diet and if you are getting too much. Helps diabetics monitor their blood sugars, food consumption, insulin levels and other diabetes related activities.